If your still a student, chances are you must have many people in your life giving you the same piece of advice over and over again – ‘Do an Internship‘. It can change your life’. While it may be frustrating for you to patiently hear your family, friends and faculty feed you the same advice repeatedly, the fact is they have your best interests at heart and are not far from the truth either. Doing this can change your life for the better and put your career on the fast track too. But before we get into that, you first need to understand the right meaning of the word ‘Internship’. 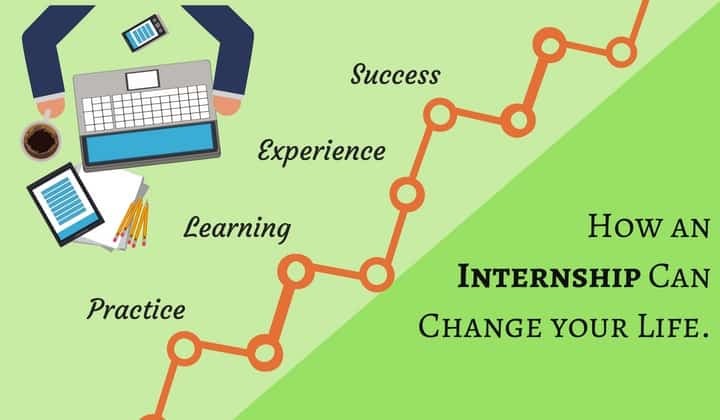 According to Online Cambridge Dictionary, the word “Internship” is defined as, ‘a period of time during which someone works for a company or organization in order to get the experience of a particular type of work’. In simple terms, it is a temporary opportunity offered by many companies and organisations to young, deserving students to work for them as interns, usually for a fixed period of between one to three months. For a student, this translates into a valuable opportunity to experience an actual working/corporate environment, have real responsibilities, learn new skills, explore their professional boundaries and get paid for it too (unless specified otherwise). Now that’s a great question. Doing an internship is important because, in today’s highly competitive job market, most potential employers show a distinct preference for candidates who have practical working experience. This may be in the form of volunteering or a part-time job. As if the competition between companies wasn’t enough, once you enter the job market a few years down the line, you will also be competing with other candidates to land that coveted job. If made to choose between two candidates, both fresh out of college, but only one with some of this experience – who do you think the company will go for? That candidate could well be your best friend from college, but when it comes to getting a job – he could also be your closest competition. It may sound harsh, but that’s the simple reality of the situation. Think about it for a minute. Now, do you still think it is still overrated? If your still not convinced…here are five more reasons why opting for an internship could be one of the best decisions of your life. Internships are the first preview of the actual working of the corporate world. It will provide you with your first experience of a professional work environment, conduct, culture and etiquette, especially one of the things to be done while you are unemployed. It will also allow you to put into practice all the theoretical knowledge you gained at your university and help you decide what works and what doesn’t. It’s also a means to break away from your routine existence and meet new people and learn about your industry in a stable and positive environment. If this sounds daunting, do remember interns are first given proper training and briefed by their seniors before being assigned actual duties. So learn to relax and learn from the experience as it is a perfect launch pad to get started with the career. Internships are the sum of our experiences that shape our character and doing this is not only a great way to bolster your personal development but also to better understand yourself. At this stage of your life, it’s essential for you to step away from your comfort zone to realise the full extent of your own potential. Take up the challenge and use the opportunity to learn new skills, job functions and responsibilities other than those given to you. It is your chance to figure out whether you wish to continue on the same career path or opt for a new challenge. Internships can also provide you with a fertile ground to get to know people, develop the right professional contacts and forge new relationships that can promote your career aspirations. Getting to know and cultivating the right people has been part of the game plan of some of the world’s most successful people. Besides, it is always advisable to network with the right people whenever the opportunity presents itself. Life can be very unpredictable, and you never know when you need to rely on those very people to bail you out of a sticky situation at work later in life. Imagine you have gone for your very job interview. Which is the one section of your resume (besides your education) that you think your potential boss would be most interested in? The Experience column. Doing this will provide you with all the ammunition you need to fill that space with relevant information. When a potential employer sees that you have invested a good 3-6 months in securing a valuable opportunity and learnt skills relevant to his company, there is a good chance that he could hire you on the spot. All you need to do is to highlight your skills in a CV and detail the tasks & projects that you were a part of, to demonstrate your value as a right candidate for the job. All internships are temporary jobs with limited company access. However, you do get unlimited access to showcase your talents, skills and dedication to a prospective employer. Now most employers are on the lookout to hire the right candidates – those with the right skills, attitude and commitment. Making the right first impression as an intern could just convince your boss about your long-term potential, culminating into an offer of full-time employment for you. Yet another reason why doing this should figure very high on your list of priorities. Now that you hopefully convinced about the merits of doing it, here a little information on how to go about applying for one. First, you need to find the right opportunity. Job portals, professional websites (LinkedIn), college training & placement cells, company websites, referrals and newspaper advertisements are usually the best places to begin your search for one. Next, it’s time to get your application ready. A few pointers here. Make the subject line of your application-specific and relevant enough to grab the attention of the HR person. Keep your covering letter, brief, to the point and relevant to the position applied for. Never make the mistake of mass mailing your application to a dozen companies. It’s never worked and never will. Avoid spelling mistakes (use Spellcheck), SMS lingo, incorrect gender address and trying to get to familiar with the recruiter. Remember your trying to get a job and not make a new friend. Last but not the least, spend a few extra minutes on your laptop but remember to attach your name to your application file. Don’t name it – myCV.doc or CV-doc – lest the recruiter can’t find it among the heap of other applications and you lose out on a great opportunity. Getting a relevant internship is not supposed to be a stressful affair, instead of a rewarding experience that could shape your life and put your career on the right track. So the next time you’re on a gap or even on a summer break from your university, you might want to consider grabbing an excellent opportunity and putting your time to better use.